After the wedding ceremony ends Yeon Hwa came to King Wang So's quarter. It was the time when Wang So came according to the traditions and the rule he had to be with the Queen and had to offer all his responsibilities and duties. But it wasn't a pleasant ceremony and relationship to the king he was being forced on it. King Wang So came to Yeon Hwa we were sad he take off Yeon Hwa's veil though it would be the most awaiting moment for one bride so Yeon Hwa thinks of herself too. She smiled Wag So had cold gaze on her face he couldn't able to pursue himself and take a step forward. Without saying anything he just left Yeon Hwa. As he was about to leave the room Yeon Hwa putting aside her ego talk to the king. She for sure knew that she was being rejected. But still she don't want to let th eother people knew about it. It was her first night and she use Hae Soo to blackmailed the king. 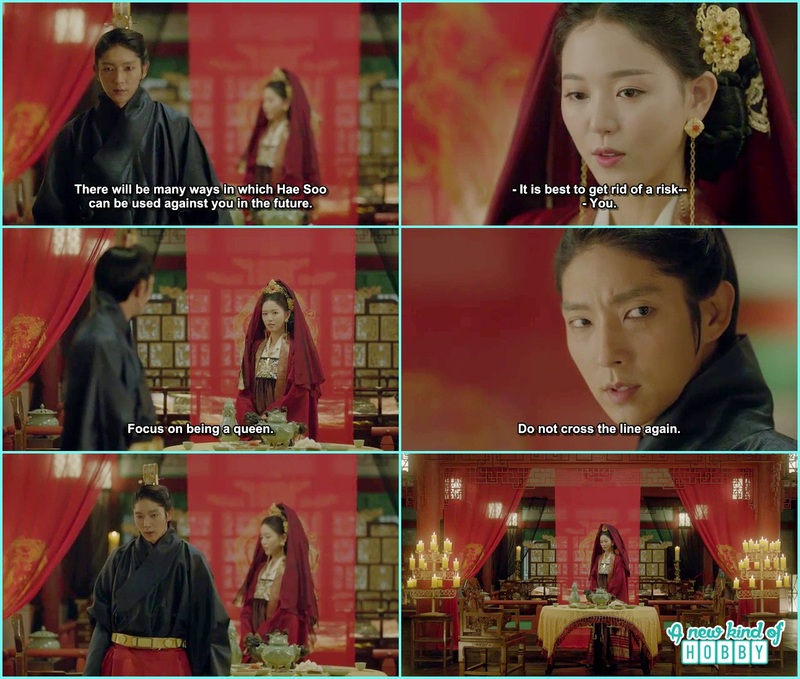 In other words she was threatning the King that with his acts she can use Hae Soo against him in future so its best to get rid of the risk. Hearing this Wang So become more angry with the gaze of Wolf he told Yeon Hwa focus on being the Queen and don't ever cross the line again. His words were like the cold water which splashed on Yeon Hwa we were happy. The King left the room. Yeon Hwa had every thing a powerful name, a powerful family and guts but still she didn't make a place wher people could love and admire her. It was because of her greedy, cruel and sel centered nature. It was the first dream night of her life. She was dressed beautifully wearing lot of gold jewellery but still we didn't find the true happiness on her face and she was coldly rejected.